After more than eight years on island, we’ve placed our St. John home on the market. This difficult decision has more to do with life changes than hurricanes. My son graduated from high school on St. Thomas. My wife and I have both been active in the island community. I’ve worked for the Friends of the Virgin Islands National Park and she is best known as “Christmas Tree Martha” for her five years of work helping islanders decorate their homes for the holidays to raise money for her non-profit disability group. She and my son have also been active in our Rotary Club. And, as readers know, I’ve researched and written two books here (available on Amazon) and more Old Town Crier columns than I can recall. We’ve had glorious adventures with our Down East 32 cutter rigged sailboat and hosted many wonderful visitors in our guest suite. As so often happens in the lives of families, though, the dynamics change. People grow up. New needs and interests take precedence and it’s time to move on, regrettably. Dynamics in the life of the extended “family” of St John’s 4,500 residents are also changing. Many old timers transplanted decades ago from the mainland are going back. Their generation worked hard alongside those born on the island to build a beautiful and comfortable community capable of accommodating thousands of visitors annually. The baton is now passing to a new generation of vibrant, creative and skilled people who are arriving daily. Just as the hurricanes initiated a cycle of creative destruction within our rapidly recovering tropical forests and animal kingdom, the storms are doing the same within the human community. Recovery of businesses and residences is proceeding remarkably quickly – mostly because of the energy and hard work of new arrivals and the young Virgin Islanders who are together becoming the new caretakers of these spectacularly beautiful islands. My wife is contemplating what it means to be a “local.” The British Virgin Islands makes a legal distinction between “belongers” born in the islands and “nonbelongers.” With our more egalitarian approach (enforced by the U.S. Constitution), Virgin Islanders wisely rejected that approach a few years ago. Can we say in good conscience that a family originating from St. Lucia, Dominica, Massachusetts or Virginia who have lived and worked here for decades doesn’t belong? In the old National Park tradition of leaving your campsite better than you found it, we’ve made multiple improvements to our own property. They include air conditioning and new windows and porches. We’ve also maintained and expanded a mature garden comprised of indigenous trees and shrubs and beautiful (although, non-native) palms, lime trees, orchids and bananas. We also have a bay rum tree purchased as a seedling from the Audubon Society. We also asked St John botanist Gary Ray to plant a few rare endangered indigenous trees. We chose our house in the hills above Cruz Bay with thoughts of the long term. 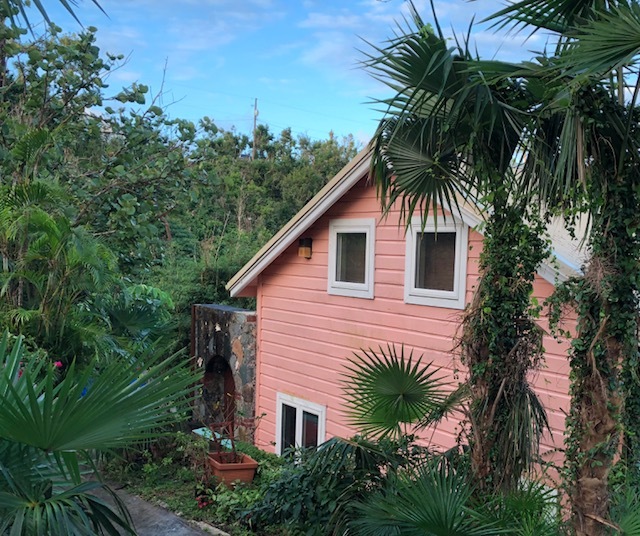 Rather than the kind of cliff-top dwellings with spectacular ocean views highly favored by visitors, our house is tucked into the leeward side of a central mountain just below the peak. It has views of wooded valleys and the Caribbean in the distance. Its’ substantially protected from prevailing winds and storm paths. Because it’s in the lee of a mountain, clouds brushing the peak yield above average moisture on us as they pass over. This creates a lush micro-climate fostering greener gardens and trees than found in many parts of our islands. It’s the reason our cul de sac was cut into the mountain side and its few homes built in the woods 30 years ago by pioneering St. Johnians who were very mindful of weather risks. They constructed homes in which to safely raise families and founded a nearby school then known as Pine Peace School and now as Gifft Hill School (which operates the only high school on St. John) and is observing its’ 30th anniversary this year. It is walking distance from our home. It turned out that we chose our property wisely. Like the locally famous contractor who built our house, we, too, were cognizant of the realities of Caribbean weather and living conditions. We weathered the worst hurricanes in St John history with relatively minor damage and our garden survived, with the exception of a very tall Norfolk Pine and an aged coconut palm. Perhaps symbolic of the Virgin Islands’ recovery, five young palms are now sprouting from coconuts fallen from their deceased parent. It’s a special joy to find baby palms growing from a nut that you can pick up and move to any spot in your yard. 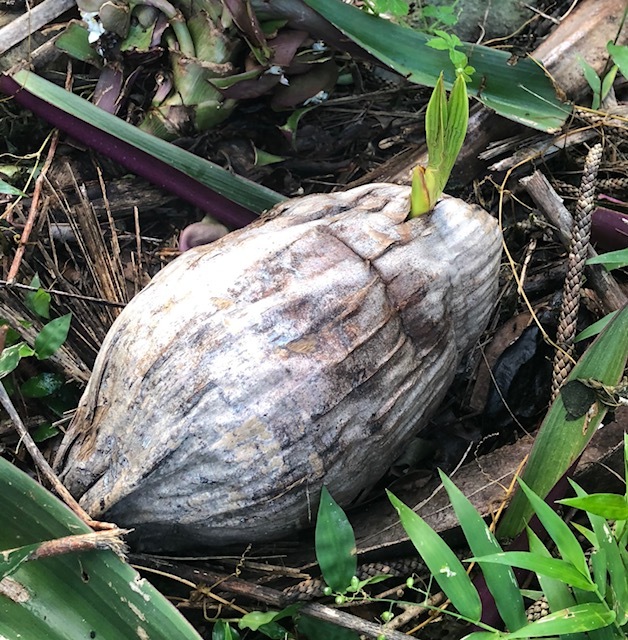 You need not even plant it, because the “milk” and meat in the coconut provides all the nourishment needed to feed a tap root below and small fronds above. All it needs is a place to rest and water. While purists prefer the native tyre palms, which have a better storm and drought survival rate, I appreciate the majesty and fruit of coconut palms. Although they are relatively recent arrivals brought – along with breadfruit trees and other South Pacific species – by European colonizers, they have a lot to offer. Another notable import are baobob trees, known in Africa as the “tree of life” that have sprouted throughout the Caribbean from seeds carried here by slaves. The only known baobob tree on St. John can be found along the L’esperance trail within the Estate Sieben plantation ruins in the National Park. It survived. The choice between tyre palms (which closely resemble the native palms of the Carolinas, Georgia and Florida) and coconuts might inform the ongoing tensions between “belongers” and others. As in the continental U.S., however, the only true Caribbean “belongers” were the Native Americans (the Taino people) and even they came to these islands by dugout canoe from South America. Whether their ruins are 18th century Danish, freshly created 20th century American or the artifacts and stone-carved petroglyphs left by Tainos, the detritus of human visitors to the Caribbean can be found side by side on small islands like St. John. Mostly covered by bush, they are picturesque reminders that we are all just passing through.